We are the children of the damned and the lost. The last four hundred years have taught us much. There is no God; there is no heaven or hell. We used to fight for freedom. Now we just fight for survival. We abandoned nature long ago, and now we pay for it dearly. The planet is barren; most natural species exist purely by genetic modification. Oil levels run low worldwide, a desperate struggle to find more sparks tensions between the world superpowers. Britain's already strained economy collapses, sending several other countries into another economic downturn. American president Obama is voted out of office. The new Republican candidate sparks tensions between America and Asia, by claiming its leaders are "Self-obsessed thugs" and refuses to apologize. Britain breaks into civil war. The world’s first fully self-aware robot was created, and immediately picked up by the US army. The US begins training and preparing these as soldiers. The last of the American Oil runs out. Russia and China hold reserves but refuse to part with it unless countries pay ten times the value. United Nations demands they part with the oil, and help suffering countries develop alternate energy sources. China and Russia leave the UN, and form the people's republic of Asia. Tensions continue to rise between America and PROA. An America Naval carrier is shot down in the Pacific Ocean. A missile is later recovered and identified as belonging to North Korea. North Korea claims the ship was attempting to steal oil reserves travelling through the pacific islands. American president declares war on the PROA, urging the rest of the western world to join in. European Allies, NATO, make a concentrated attack on Russian supplies. Russia responds by expanding into parts of Eastern Europe, previously neutral. Parts of Scandinavia ally with the PROA, partly from fear of attack. America promises to rebuild and fund several African nations when the war is over, in return for assistance against the PROA. Many accept, believing this to be the start of the United Nations of Africa. The PROA now controls most of Eastern Asia, including Japan, which they use to help produce robotic soldiers. American abuses the control over many African nations, using the people as fodder. African nations that did not join the union, such as Egypt, rebel against American rule, but refuse help from the PROA. NATO forces capture Moscow. PROA retaliates by nuking Britain. The British civil war halts and the people unite to return fire. America Nukes the PROA heavily, murdering billions. PROA Nukes several major America, African, European and even Australian Cities. PROA captures Germany, using only robotic soldiers. America develops a highly experimental "Super soldier project", combining genetic manipulation and mutation. A scientist predicts half the world's population have been killed or mortally wounded since the war began. Super soldier project condemned by NATO, after an entire town is found mutilated and mutated, attempts to bring medical aid to the mutated people fails, as PROA raids the support, and the mutants kill the rest. PROA sends their last robots to the NATO headquarter located in France, hoping they will win the war. NATO finds out about the attack and evacuates the whole sector and retreats to America. When the robots arrive they detonate NATO's trap. The trap activates a huge EMP that was mainly supposed to only destroy the robots, but the EMP goes out of control and stretches around the whole world. The world is now officially without any electricity or energy. Fighting slows down. Most people are mutated or dead. Vast starvation wipes entire countries out. The last government remaining crumbles. The EMP effect starts slowly to recover. Survivors band together for survival, and begin work on preserving species using advanced cloning and genetic manipulation. The first new city is established. The EMP effect is fully gone and all electricity is back. "The survivor project" flourishes. With the aid of advanced robotics, genetic manipulation, twenty new cities are built and quickly populated. The war is referred only as "The Great Ruining"
Advanced "Diamond Cities" form, the government and services ran entirely by Robots, but still controlled by people, who now live in almost paradise. A Robot refuses to clean up, after its owner deliberately knocked his food on the floor. The owner then demands the Robot "take itself apart", and threatens him with a hammer. The Robot snatches the hammer from the owner and kills him with it. A Robotic revolution ensues, striking disaster everywhere. Cities break apart as Robots everywhere turn against Humankind. The last city falls to Robot command, having expelled all Humans. The Robots have won. The Robot cities quickly advance, and launch a large portion of Robots into space, intent on destroying any intelligent biological life. Advanced mutants herded by Human resistance break into the Robot Capital, and destroy the central computer, breaking the communication link between the Robotic cities. Large mutated giants have been spotted in some parts of the world, capable of surviving in even the harshest terrain. Most Robot cities now heavily overrun with mutants. In a desperate act to regain control, the robots launch an atmospheric bomb, with the intention of eliminating the atmosphere, thus destroying all life. The bomb is sabotaged by Human forces, but still launched, causing catastrophic damage to the earth, in ways that we still don't understand. Strange storms of various types appear. Robotic scientists work to fix the damage, but fail to succeed in time. Electromagnet storms break down the Robot circuitry, and the last of them power down in storage, deep below the earth's crust. Very little is known about the Human race during this time. Little or nothing is documented or known about what happened. Most people die young, fighting mutants or from radiation poisoning, while seeking areas to live. A sub-dimensional radio known as "the great link" is established. Human survivors pick up the signal and begin collaborating to work together and survive. An undetonated atomic bomb that was found by some roaming survivors. After inspecting the device, they decided to try and disarm it. At first they had very little idea of how to do this. Looking around they found several Tech books and mappings of the bombs workings. Still unsure of whether it was a good idea, they didn't have the slightest idea of what kind of bomb it was, one of them murdered his friend in a heated argument about how to defuse the bomb. The other two restrained him until he agreed to help. Together the remaining three buried their accomplice in the ground and finished the preparations they deemed necessary. The Second man found the name of the Captain in charge of the launch site. General Cirix Morgan. Having no knowledge of the pre-war events, he disregarded the name and attempted to dismantle the bomb from it's place. Then one of them noticed the bomb wouldn't detach from the tower. Knowing full well the repercussions of such a mistake he hurried out to try and fix it. When one of them tried to tinker with some wires, a timer was initiated. The last guy watched in horror as the count-down hit zero. Being completely de-assimilated, he wasn't even aware of his death. The people in a 200 mile radius were killed or hurt bad enough to die. Those who were outside the 200-mile range survived, ensuring humanities continuous life despite the mistakes of others. The land around the bomb was so radiated and scarred that it was almost impossible to live around it. The Second Bi-Uranium Bomb shifted the Northern Pacific Plate and all of British Columbia was changed. Those left over spread out to repopulate and rebuild. 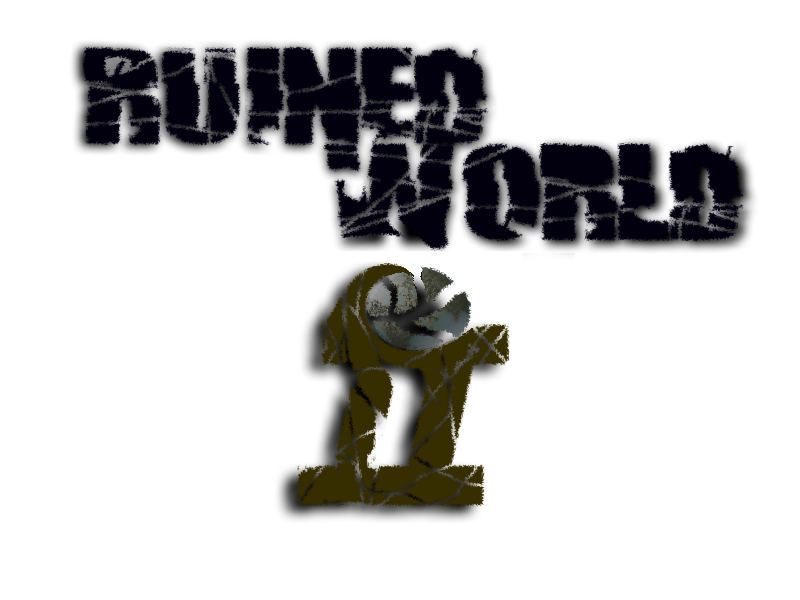 The previous Ruined World. Every night, the Human race fights mutants for survival. Some are successful, many not. Rumors grow of possible faction leaders emerging. Robots that have been deactivated underground in Robo Co. Facilities are reactivated by the electronic waves given off by a Nuclear Explosion. Will the Human race finally be wiped out? Will the Mutants ever be eradicated? Several developed cities emerged, due to a sudden increase in commerce. The conflicts between humans and monsters slowly shifted into contests of power behind the city walls. Certain groups now have control over large plots of land, and officially started city states. Independent nomadic survivors eventually found a place to stay and call home. Populations were growing. Apart from the occasional settlement being overrun, humanity had slowly began to rebuild itself. It had begun to take the form of the past. Due to the lack of humans overall, many of the power figures had formed personal relationships with each other. This prevented many wars and conflicts from taking place. The county of Blackholm is founded. Teams of people, known as Seekers, are formed to seek out old technology to better the development of their cities and humanity. Few of the Seeker groups are successful, but one of the Advent groups had discovered an old terminal, with access to the database for a company known as Dynar. Before the war, that company had been researching ways to modify humans to improve their overall attributes. Word of this discovery was meant to keep quiet, but it had spread, eventually reaching the ears of TJ Drago, the head of the Dragonians, Quintus Aerulius, a high up figure for the Legion, and Victor Halifax, the leader of the Frantanzella. They all wanted access to it. All contact with Advent had been severed, and their cities previous location was covered in a dense smog of poisonous radioactive gases and fumes. Many had attempted to access the city, but all had failed, and Advent was deemed, lost. Due to domesticated creatures, transportation became available, and trade flourished. The scientist, Quinn Hatrik, who was famous for the development of a Legion super weapon known as the Hydra, had shifted his research from survival, to profit. He and his team of researchers went on to research the rift. After his work and research, he personally funded a project to enter and study it. He called the project, the Second Hell Jumpers, in homage to the original. He sent for separate teams into the unknown, each lead by survivors of the first, Andrew S and AJ Williams among them. During the expedition, ruins were discovered, housing sentient elemental beings, which had manifested in the more recent years. The beings came to be known as Magmas and Burners. Eventually, they came across another portal within the ruins. It was very different from the ones that they used to travel between their world and this one. It was built in a way that almost appeared sealed. When the Hell Jumpers attempted to open it, the physical part of it disintegrated. All that remained of it was a door shaped sparkle. Suddenly, something emerged, that had been described as nothing but, a demon. The rest of the expedition was not described, as the survivors had no desire to continue further. They had been mentally scarred. When they finally escaped, they ordered all portals to be shut down and closed. The portals themselves had become abundant, as they were regularly used for transportation. However, to their wishes, all of the portals in Hadrian’s Wall had been shut down. The same could not be said for many other towns. The creatures flooded through, and decimated entire colonies. Fortunately, due to a pact signed by the Dragonians, Frantanzella and NOD, all towns under their command had outlawed Rift travel. They survived. Most others, didn’t. Settlements like the Hive and Blackholm were considered lost. The surviving towns were all within a 70 mile radius of each other, so a massive wall was scheduled to be build surround them. Construction of the wall was very slow however, because the new “Demons” constantly harassed the builders. The wall project was then abandoned, due to the unworthy risk. Alliances and trade slowed down. The Frantanzella had discovered a new method of fighting these demon. Humans could not be detected by them if they never make eye contact. This knowledge was then shared with the other major cities. The towns survived on their own, and learned to survive without external assistance. Alliances were then nonexistent, and the towns had become independent. Over this time, many of the human leaders that were so fond of each other had died, severing any connections between governments. Contact between the cities was still existent due to the great link, but other than that, nothing happened between them. Also during this time, grass and greenery started to show up again. Contact with the Dragonian capital ceased. The entire city had gone silent. When investigated, it was discovered that they had been slaughtered. Not by mutant, not by war bot, not by demon. By human weapons. Carved into the center of the town square was a black mark. A circle divided into four segments, with one filled in. Above it, words were written. OPERATION FULL CIRCLE. It was unknown who had committed these crimes, so the towns started blaming each other. False evidence was created against each City-State, and wars were waged. Smaller wings of each empire were lost, populations were massacred, political figures assassinated. War. The NOD and the Legion signed a treaty with each other, agreeing to fight alongside one another to defeat the Frantanzella. They both thought the Frantanzella was responsible for the Dragonian Massacre. The pact was successful. During June of 2312, the Frantanzella capital was under siege. They were unable to sustain themselves, and after multiple futile counterattacks, they surrendered. The Legion and NOD both left the site. A day after, diplomats returned to the city. Everyone inside was dead. One the wall of the governmental building, a dark circle, half filled in. The two factions agreed to move their populations to Hadrian’s Wall, which was the most fortified city. Lacking resources and disease rode rampant throughout the city. Overcrowding caused many deaths. No attacks by the unknown enemy. The population of Hadrian’s now only at 80% of the population 4 years ago. Population of Hadrian’s Wall drops to 70%. Current leader of the NOD sends out teams of his troops to scout out the area. When the scouts returned, they brought news of their capital being destroyed, with another circle with 75% of it filled in. They also brought news of large amounts of footprints, as in troops moving. One day a man dressed in all dark robes walked up to the gate. He stood there for, as written, forever, and when confronted he spoke two words. “Blackholm lives”. He then pulled his robe off, revealing a layer of explosives on his body. He then ran at the gate, attempting to destroy it, but was shot before he could reach it. The people at Hadrian’s had no more contact with Blackholm since the martyr, but people were growing frightened. The population at Hadrian’s was very valuable. Every man, woman, and child was needed. If the people at Blackholm could sacrifice one of their own, just to carry a message, that must have meant they were severely outnumbered. In panic, they assembled a team of their best warriors to seek out an old folks tale; Taboo. Taboo was supposedly some kind of extraterrestrial humans had encountered over 100 years ago, and should have been staying in a cavern known as, The Bear’s Den. The cavern was notoriously dangerous and un-enterable. But within the walls of Hadrian’s, the people’s fear grew from the unseen darkness that threatened them. They sent the team to the cave, and hoped for the best. No word from the team. They were reported a failure, and deemed deceased. This announcement was not beneficial to morale. In fact, it was detrimental. People grew frightened, and some even left the city, once again dispersing their population. Between the fleeing civilians and disease ridden homes, the actual population of Hadrian’s Wall had decreased to about 50%. Almost half of the entire alliance had died or went missing. However, while suffering and pain were part of everyday life, something incredible happened. On one dark night, when the noise stopped, people looked up and saw something. This star was a symbol of hope, luck, and restoration. Such a sign of prosperity, that the people living within Hadrian’s Wall set aside the differences of The Legion and NOD, and joined under a new flag. A golden star with a black backdrop. Hadrian’s Wall was no long known as Hadrian’s Wall. It was from that moment on known as, Commensia. With their newfound confidence, the Commensians organized a fighting force to combat the mysterious threat, and sent them to follow the discovered nearby footprints. When they returned, they brought word of a dark city looming beyond the horizon 40 miles to the East, with troops lined up, as if they were preparing to attack. Blackholm. While thought to be destroyed in the wars against the demons, the town actually was able to close their portals before they were overrun. They barely survived, and (based on future literary discoveries) had attempted to contact the cities. Needless to say, these calls had failed. They blamed the Alliance for the creation of the demons and rued them for their inability to pay them any attention, and from that point on, they rebuilt in hope of being able to destroy the Alliance. And they were getting pretty damn close. However, despite this, the Commensians held on and prepared to defend themselves. With Blackholm looming on them, the Commensians prepared for war, even though they knew they were outnumbered. Most would say outmatched. On September 14, 2326, an earthquake was felt by the citizens of Commensia. But it was no earthquake. Suddenly a light appeared above the river that Commensia was located next to. It glowed with a green intensity unsurpassed by anything they had seen. Suddenly, the warriors gathered to find the alien Taboo dropped from it. They scrambled to the shore and climbed into the town. They heard a voice speak an alien language, and then it spoke English. “Your ancestors were kind to me. I am repaying the favor.” Suddenly, as he said that, there was a multitude of tremors. “Be kind to them, as you were to me.” The light then suddenly vanished. The citizens of Commensia sat there dumbfounded. As written, a shout was heard from behind one of the walls. People were confused, and did not know what to do. Then, a scraping was heard. A hole opened in the wall, and in walked a large reptilian humanoid. It had light blue eyes and stood with certain fierceness. This was Hamar, the Valoshan prophet. The creature then spoke. “We are the Valoshans! We come in peace!” Then, many more like him approached the town. On February 9, of 2327, the Battle of Commensia took place. Not very much is known about it, as a very large percentage of the population was killed. All that is known, is that the Commensians failed at protecting their walls, but won the battle itself with the help of the Valoshans. With the remainder of their military force, the Commensian General, Alexander Walton, and Hamar approached Blackholm. Then, only a day after the Battle of Commensia, the Viva Aertana took place. The next few hours were the last of many. The remaining military force of Blackholm was decimated by Hamar. They were victorious. They had a merciful victory, as they spared the civilians the same fate that befell the other great empires. They had won. The dark times were finished. When they returned to Commensia, the benevolent feeling flew away. They realized the city had been destroyed. Nearly burnt to the ground. They scavenged for usable resources and food, but found little. Then reality agreed with them. They had done what those back in the days of the Great War did. They destroyed their enemies, but at the cost of themselves. For the next 70 years or so, humanity once again struggled. Very little happened. Greyhope was founded. Many of the previous occupants of Blackholm lived here. New Commensia was founded. The Valoshans and some of the Commensians lived here. When the two towns discovered each other’s existence, nothing happened. They put aside their differences, and had not acted hostile in any way, shape, or form. They even set up trade routes with each other. The smog around advent was thinning. When a few explorers from Greyhope were sent to investigate, they didn’t return. It was said the radiation was still too strong and had killed them. People reported that they were approached by speaking plants. Those reports were also immediately discarded, because of the increase in the growth of Durrafin plants, known for their hallucinative properties. After Greyhope had acquired the resources to do so, they constructed a gateway back into the Rift. Although the “Demons” were a problem, they knew how to combat them, and could manage. They would also regulate the travel through it, to prevent public access. When the first portal was opened, a group of militiamen entered to scout out the immediate area. They then brought builders inside and constructed Fireside, a fort within the Rift. Two years after the construction of Fireside, a guard noticed a small group of people approaching. He thought they were a scout team. He was wrong. When they were with sightlines, he realized they weren’t a scout team. They had red skin, and green pupils. They started at him with a mixture of hate and gratitude. They were the Drakmua. The lost folk of the Demon Crisis. (For more information on how they came to be, see their race history). After they had explained themselves, they were allowed into Greyhope. Of course, there was discrimination towards them at first, like being called Hell's Agents, but afterwards they were accepted and treated as equals, to an extent. The smog around Advent had completely cleared. When the Geiger counters stopped ticking around Advent, a small group of New Commensians and Valoshans approached the ruins. When they reached the old city site, all they found was a massive crater. They also found a rope tied to the side. They repelled down to the bottom, and found a large metal door that was cracked open. A small cloud of steam was escaping from it. They entered inside, only to find corpses stripped of their clothing. A few meters away from them they discovered a man with greenish skin and vines protruding from his back. As they furthered into the ruins, they discovered something old and magnificent. The rumored underground gardens of Advent. They were greatly coveted by the other ancient cities’ rulers. Then they heard a noise from behind them. It was an odd sound, a sort of gurgling. They turned around and saw a woman. This woman was alike the man they found at the entrance of the ruins. She was green and had vines escaping from her back. She spoke with a harsh raspy accent, almost with reverb. She said “Do not be afraid. I am like you.” She told them of her people’s history. The people known as, The Herboxtians. (To learn about them, please read their race description). The group brought them back to New Commensia, and allowed them to stay there. Because the Commensians had grown fond of the Valoshans, they welcomed the new race with no dispute. Small conflicts between the two cities dot the wasteland. Tensions rise between the two cities. Modern day. Two civilizations are once again competing, issuing futile endeavors to prove their worthiness over the other towns. Those who inhabit the planet Earth are struggling, as the prewar creatures still roam the land, searching for blood, no matter how innocent or guilty. Death is a common sight. People learn to make little bonds with others, as they probably won’t see them again. The land surrounding them is charred with the fire and bones of centuries of warfare. Towns are built from those ashes, but then are burned and return to them. However, despite the darkness, despite the harshness of life, there lie two dim lights in a sky of blackness. Be it the Golden Star of New Commensia, or the Circle of Greyhope, both have potential of success. But that potential equates to failure as well. You are a survivor. This ground has seen the apocalypse multiple times, an yet you are still there. Your history is yours, and already written. But the events of the next few years determine this planet’s future. Go become the scribe of tomorrow. Take action. 2449: A treaty is signed between Greyhope and New Commensia, putting Greyhope under commensian rule. The was the founding of the rethosian empire. With the change of the seasons, a new cold front comes along and freezes the New Commensian area. Due to the fact that Valoshans are unable to survive in the cold, the city was evacuated and it's population transfered to the newly founded city of Rethosia. A man of an unknown name had discovered that he had a diseases only curable by the egg of the previously destroyed monster. The monster, thought to be destroyed, was reincarnated. This was the man's only hope for survival. He gathered some of the most powerful people in the wasteland, and sent off to take it down. This group included the man himself, Alexander Williamson, Schatten Ninross, Rydos, Arthus, Boziik, Tatoo, and Kronaak. They were successful, and had no casualties (However, Boziik died a lot, but we revived him a bunch ). The satellite that was the origin of the great link crashed in the wasteland. Due to the efforts of the denizens living there, they were able to repair the damage that had befallen it, and launched it back into orbit. However, this was not before they discovered a message. The specific contents of it are unknown, but it basically stated that a race known as the Ih'Shruken were coming to destroy them. This made segway into the efforts of all major cities to create Earthly orbital defenses.